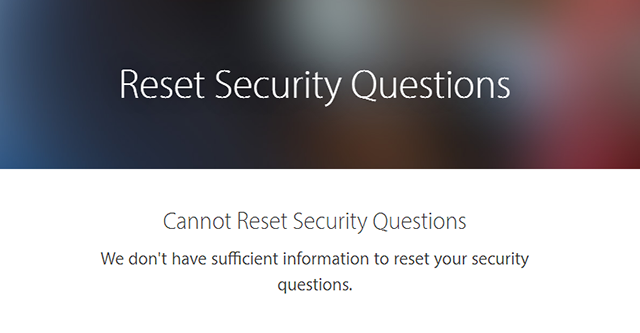 Cannot Reset Security Questions "We don't have sufficient information to reset your security questions"
I was trying to recover my Apple ID account yesterday and gone through a process to change Apple ID password and secret questions as well that I totally was forgotten. If you are in the same boat then you must be interested and want to recover your account as well. While Changing password of your account or modifying the secret question process is automated, but sometimes you may need to contact Apple support and remember one thing you can only recover your own account If it’s truly yours otherwise Apple will not help you in this matter. When you try to login to Apple account and for identity verification purpose Apple may ask to enter the answers to your security questions. If you forgot answers to these security questions then you need to click Reset Security Questions as you can see below in the screenshot. What can you do when you getting this message? You can contact directly to Apple support for Apple ID security related problems. Go to the previous page and click the “Get Support PIN” button and then follow the below support link. Link to Apple support page: https://support.apple.com/en-us/HT204169 where you can get the phone number by region and country. Please make sure you call the support during working hours. Below method to reset password or security question only works if you have access to your rescue email can verify your identity by answering security questions. To reset Apple ID password with an automated online process you need to open this link and click on “Forget Apple ID or password” link. This trouble signing in page can help you to reset forgotten password, recover and unlock your Apple ID account. Enter your Apple ID and also type the character in the image if showing after that hit Continue link. On the next page select “password option” and continue. Now choose how you want to reset password either by sending email to your Rescue email or by answering Apple ID security questions (Forgot secret question as well? then read below or contact Apple support). Choose appropriate option and hit continue. If you choose “Get an email” then Apple will send and email with a reset password link, simply go to your inbox read this email and click the “Reset now >” link and this will redirect you to create a new password for Apple ID. When you select “Answer secret questions” option this may ask you to enter your date of birth and then secret questions. Follow the on-screen instructions and you will be presented with a form to set your new password. To reset security questions that you have chosen while creating your Apple ID you must have to pass through identity verification. Enter you Apple ID and continue to the next step. Choose appropriate option and continue to change security questions. Here, you need to type your Apple ID again and hit continue, follow the on-screen instructions and verify your identity. Remember if you can’t see and option or you unable to verify your identity here then you can’t reset security questions. When you successfully passed the step then choose your new security question and save them. I forgot my security questions but I know everything else. Is there any way I can reset security questions? I got this message and called Apple support. They said they would reset them, but would only do so if I answered the security questions first. After checking they weren’t joking I tried to explain the flaw in their process. I think he got it, but not enough to help me out. Stuck without access to my account, even though I have access to the email account and know the password. Their logic is broken and for me, when it’s broken on security in such a rudimentary, basic way – surely it would have come up in testing somewhere – then I don’t want to play anymore. Cannot agree more. 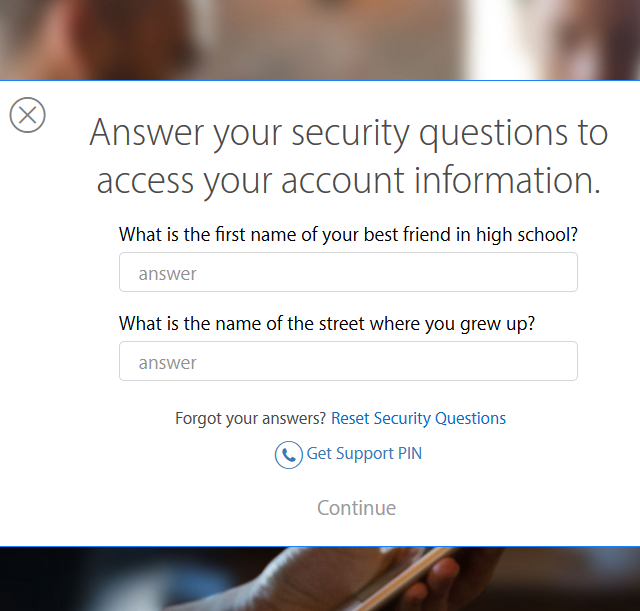 Their logic is broken – the only way to reset security questions are to answer the security questions correctly. What if someone hacked your email account and create an Apple ID using it. It happened to me. The thief set up the security questions and Apple said the thief could still change password as many times as they want as far as they know the security questions and the only thing I could do is to verify myself by answering the security questions correctly! How am I supposed to know the answers to a thief?! It is like to help with the crime!! Absolutely broken process, as described. You MUST answer at least some of the security questions to proceed. The apple rep on the phone was helpless to get past that point without the answers. The worse problem for me is that the email address associated with the appleid can never be used with apple ever again, because it is associated with an appleid that is locked shut forever. I forgot my security questions but when I click reset option it says Cannot Reset Security Questions “We don’t have sufficient information to reset your security questions”. Is there any way I can reset security questions?